Hallowell officials want people out of Front Street on Friday, as emergency officials have told local communities the Kennebec River will flood. The National Weather Service is predicting a 90 percent chance of minor flooding, and the city is planning the evacuation of Front Street late Friday. According to the weather service, the water level in Augusta will begin to rise at 7 p.m. Friday and reach its peak from 1 p.m. to 7 p.m. Saturday, then slowly taper down over the next five days. The weather service estimates the water level in Augusta will be 14 to 16 feet above normal, classified as minor flooding. Kennebec County Emergency Management Agency Director Sean Goodwin said Thursday afternoon that the agency has told the city that it will flood. In Augusta, city officials are preparing to close parking on their Front Street, and they plan to set up barricades and electronic message boards. They will notify property owners downtown, according to a Thursday email chain among city officials. 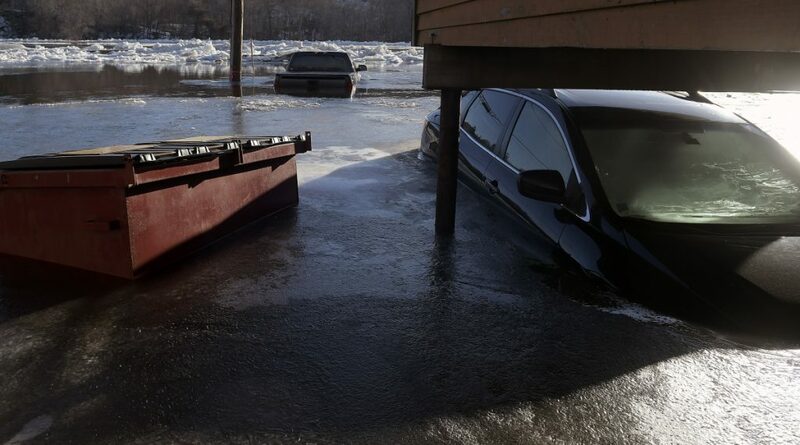 In January, as many as 20 cars were destroyed and 24 businesses were damaged after water levels rose because of an ice jam. The Kennebec Journal reported that a breakdown in communication between the county and local emergency management officials led to downtown residents and business owners not being wholly informed. In Hallowell, which is built closer to the river, the water level is expected to be around 16 to 21 feet. Hallowell City Manager Nate Rudy said Thursday that at the 16-foot level, water would reach the Hydeout at the Wharf tavern and the 21-foot level would reach the porch of the Easy Street Lounge. Rudy expected to evacuate Front Street on Friday evening. Goodwin said workers for his agency will be stationed along the river monitoring flood levels and assisting municipalities if they need barricades or assistance with evacuation. 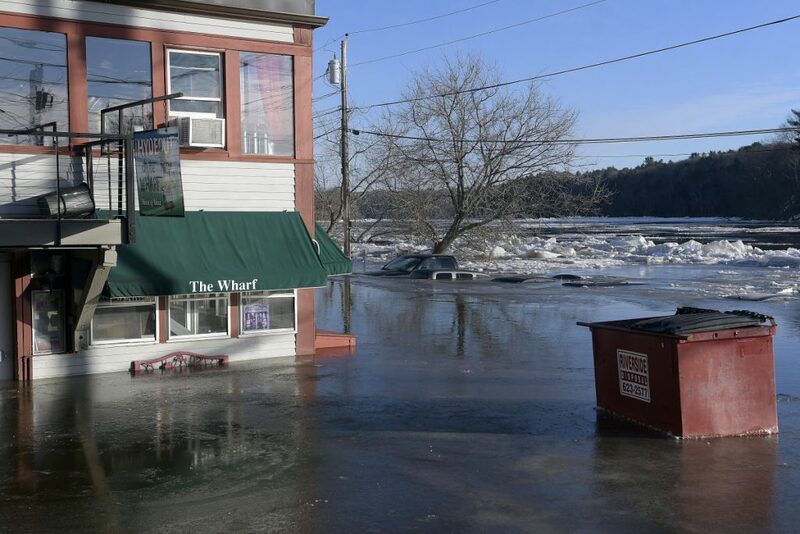 On Wednesday, the Kennebec Journal reported that local officials were monitoring flood levels and informing downtown residents and business owners about flood potential. 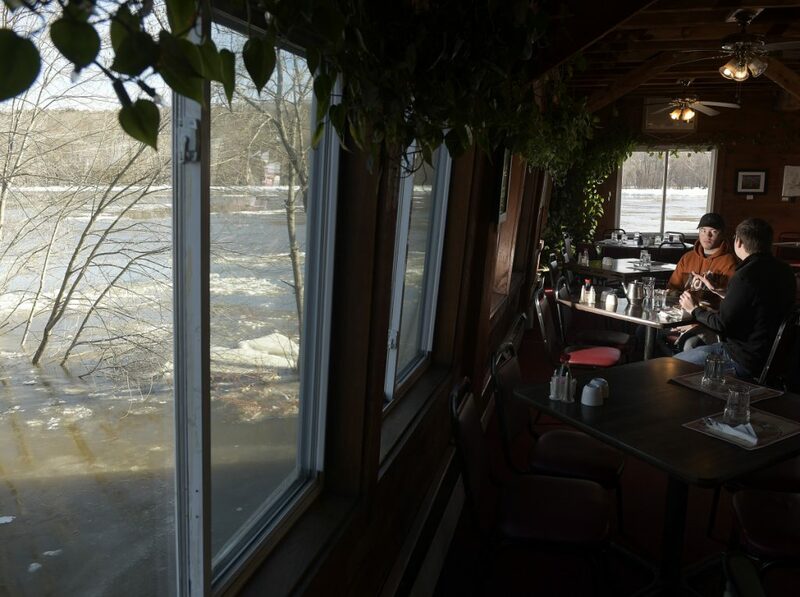 Emergency management officials are predicting ice jams from Friday until Saturday night along the Kennebec River because of heavy rain and unseasonably high temperature. The National Weather Service’s forecast calls for heavy rain and temperature in the high 40s and low 50s Friday until Saturday night. Sinsabaugh said any flooding would be caused by ice jams, which are hard to predict. Goodwin said Wednesday that flood conditions will be worse Saturday into Sunday, as northern parts of the Kennebec River fill with 2 to 3 feet of melted snow and the water flows downstream.